Your opponent cannot target Spellcaster-Type monsters you control with Trap Cards or effects. You can only use the following effect of “Time Pendulumgraph” once per turn. You can target 1 “Magician” Pendulum Monster Card in your Monster Zone or Pendulum Zone, and 1 card your opponent controls; destroy them. Then, if this effect did not destroy 2 cards, you can send 1 card on the field to the Graveyard. Time Pendulumgraph wraps up our week looking at Pendulum Magicians. The flip side of Star Pendulumgraph, this card protects your Spellcasters from Trap cards. Instead of direct searching, Time Pendulumgraph offers more field control options with destruction ability. Destroy a Pendulum Zone or Pendulum Monster you have and a card your opponent controls once per turn. If you don’t destroy two cards, you can send a card to the grave. This effect ensures that you will at least be getting a 1-for-1 trade with your opponent. Destroy Double Iris and a card your opponent controls, get a search from Double Iris. You can destroy one of your Pendulum Zone or Monster cards to go after a monster that cannot be destroyed by card effects, then merely send it to the grave after. “Sending” can avoid destruction-triggered effects and searchers. Time Pendulumgraph allows you to play around certain cards that have inherited protection abilities. Timestar Magician, Star Pendulumgraph, and Time Pendulumgraph on the field locks your opponent almost entirely out of the duel. No Traps affect your monsters, no Spells affect your monster, protection via Timestar against destruction effects of any kind once per turn. With those cards you are funneling your opponent into attacking, and you still have your full assortment of cards to use against them. We end this week off with the Trap Pendulumgraph card, Time Pendulumgraph. 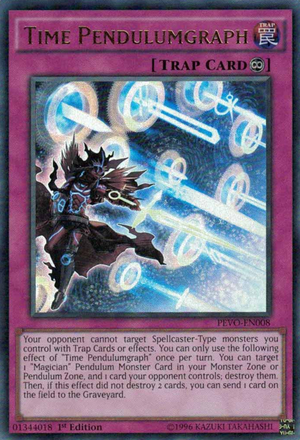 Time Pendulumgraph is similar to Star Pendulumgraph, where this card protects your Spellcasters from being targeted by Traps as Star did with Spells. Once again, any protection is lovely, but this isn’t why the card is staple like Star Pendulumgraph. The effect of this card is a hard once per turn like Star Pendulumgraph was, where this card lets you destroy a Pendulum Magician you control to destroy another card on the field and if 2 cards were not destroyed, you can send one card from either field to the GY. Card removal as we have proven earlier this year with Zoodiac Drident and Master Peace, is great, and this can possibly remove two cards. Obviously the first part targets, but if you protect your Pendulum Magician with Timestar Magician or your opponent protects their card somehow, you can send a card to the GY, and this doesn’t target, which is great. It also synergizes with Star Pendulumgraph since this can destroy a Pendulum Magician which in turn lets Star Pendulumgraph get you a search for another Pendulum Magician. Again, this card is searchable and it is a hard once per turn, play two of it similar to Star Pendulumgraph since both are great cards. Time Pendulumgraph…as if you didn’t see this coming by now, if not earlier? This Continuous Trap is the opposite of yesterday as it protects you from Trap cards, as I was trying to dodge saying and referencing in my review yesterday. This card is crazy good, especially in terms of advantage for you. It lets you 1-for-1 a Pendulum on your side of the Field to destroy one of your opponent’s cards AND if you’re unsuccessful, you get to outright destroy a card on the Field. Making this a +1 (or more even, depending on what you destroy) and obviously, this is only able to be done once per turn. With all the advantage here (looking at the first effect) and the ability to generate pluses from referenced reviews earlier this week, you can mass plus/advantage from this card in no time. Same for the second effect honestly too.